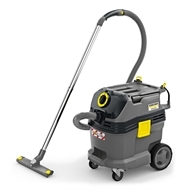 This compact multi-purpose vacuum has an impressive Tact automatic filter cleaning system and a moisture-resistant PES flat pleated filter for the dust-free removal of large amounts of fine dust over long work intervals. Dirt and liquids can be reliably collected in a rugged 30-litre container which has a bumper and sturdy metal castors. Its easy handling and operation via the machine's new central rotary switch make work much easier. The machine comes complete with newly developed and highly improved accessories which can be conveniently stored in the integrated suction hose and accessory storage feature. Rubberised surfaces and lashing options mean that tools and boxes canbe placed on the flat machine head in a slip-tight manner or even affixed to it. Enables secure fixing of hoses of different lengths and diameters. The power cable is always stored safely for transport. With the detachable filter casing, removal and replacement of the filter is dust-free. It is impossible to insert the flat pleated filter incorrectly.